Two Major events, with two winners on completely opposite ends of the spectrum. John Murray and Scott Martin both started their professional careers around the same time (Murray’s first full season was 2001, while Martin started in 1999). Yet, their careers have progressed on two different roads. Martin has established himself as one of the best anglers in the sport, winning an AOY in 2015, while Murray only has two top 10s in the last five years, and they both came in 2013. 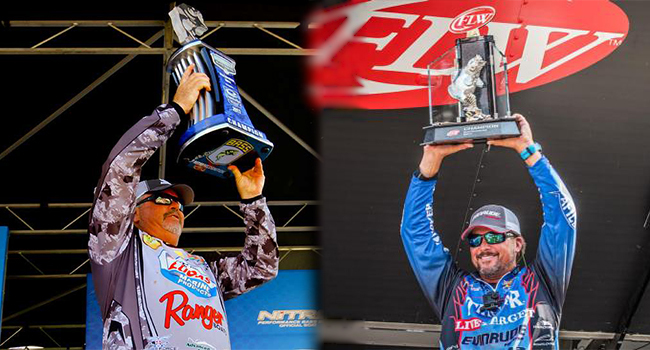 All that aside, their roads converged in a unique way this weekend, with Murray winning his first Elite Series event on Toledo Bend and Martin winning his record eighth FLW Tour event on Lake Cumberland. As for their rankings, no surprise, Martin is a bit higher. His latest victory has the former No. 1-ranked angler sniffing the top 10 again, as he sits in 12th. Meanwhile, Murray is back in double digits, as his victory bumped him to 97th. Looking at the top 10, there was plenty of shuffling after this weekend. Jacob Wheeler dropped the second of back-to-back mediocre events in March 2015, and he’s now sitting in second. Jason Christie is also back in the top 10, sitting in eighth, but the big story is Chris Johnston. After debuting in the rankings at No. 1 a month ago, he’s fallen all the way to 24th after the two worst finishes of his young career.